Today was our second day at dog camp (huh?). I slept a fitful night last night, partly from pre-dog-anxiety, partly because our misunderstanding of the in-room heating unit caused our room temperature to fluctuate between 10ºC and 35ºC. Needless to say, when an opportunity came to cut my losses at 6:00 a.m. I jumped at it, bustled myself out of the room and headed across the long, dark, cold bridge to downtown Oakville to fetch coffee from Starbucks, the only place open at that early hour. I was back at dog HQ in plenty of time for breakfast, and the formal training sessions started up, on the dot, at 9:00 a.m.
Today we covered a lot of ground – starting with how dogs think, how our dog will fit into our family and our everyday life, and, in the afternoon, running through the commands that our dog guides have been trained to respond to (stay, forward, down, off, hugs, etc. ), and running some practical exercises, first with each other and later with real dogs (stand-in veterans, not ours). 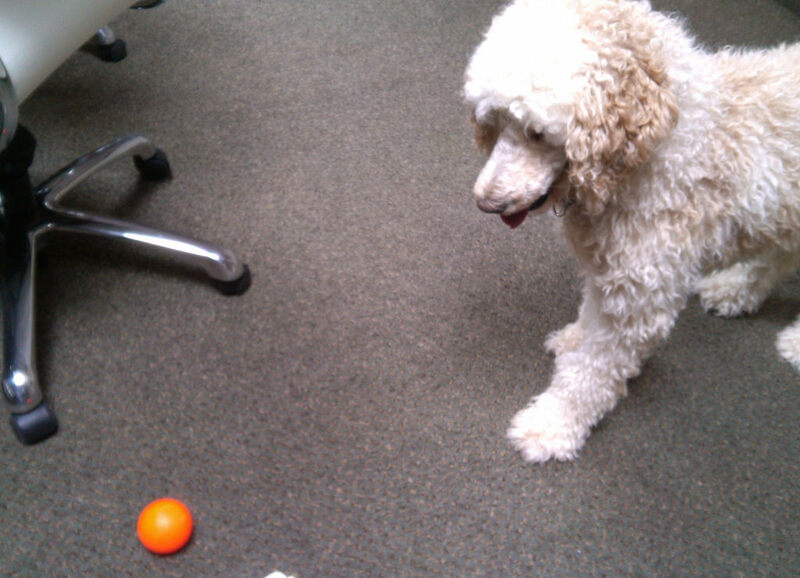 Along the way I fell hard for an espresso-coloured retired service dog, a poodle named Greta, who kept me entertained for a good chunk of the afternoon bringing me an orange ball to throw for her. Any misgivings I had about the poodle kingdom were set aside, as Greta proved to be everything a lab or golden retriever is, but with moxie and a Yoda-like intelligence. It was a good corner-turn at the right moment, given that we’ll become poodle-handlers starting tomorrow. The “what is our dog’s colour and name” mystery has turned into a fun game between our trainers, who both know, and we handlers-to-be, who don’t. I’m sure there are pedagogical reasons for this — although what they are eludes me. Perhaps it’s simply to keep us focused? In any case, it’s something we don’t learn until tomorrow. But cracks in the armour have appeared: today one of our number wondered out loud whether at least the genders and first letters of the names might be revealed, and this proposition was accepted, which is how we came to know that the dog that we will meet tomorrow with be a male Standard Poodle with a name starting with the letter ‘E’. Immediate tinder for the imagination: my brother Steve alone came up with (via Twitter) Ephram, Esteban, Excelsior, Evan, Edgar, and Etienne all within a couple of minutes (I later learned that none of these is it). So we have another night to let visions of a Dog Named Eggroll™ dance in our heads. And then, the story goes, sometime tomorrow we will all be ushered back to our rooms to wait for Ehud, Esmé or Ernie, along with his trainer, to come calling. Introductions will be made, and then we’ll be left to get to know each other for a while before reconvening for some serious heel, stay, down, off, hugs action. From that point on, our dogs are under our care, 24/7. They sleep in our room. We feed them. We groom them. They come with us to breakfast. Just like real life. Which is the point. After I cut outta here on Saturday afternoon, Catherine’s got five more days of acclimation left: there will be visits to the mall and to Tim Hortons, discussions of escalators and elevators and international travel, and much opportunity for bonding. In the meantime, watch this space for the letter E to turn into a fully-fledged name. Written March 13, 2014 at 11:53 p.m.